There are over 20 million young people of color in the United States whose representation in STEM education pathways and in the STEM workforce is still far below their numbers in the general population. Their participation could help re-establish the United States’ preeminence in STEM innovation and productivity, while also increasing the number of well-educated STEM workers. Minority Serving Institutions examines the nation’s MSIs and identifies promising programs and effective strategies that have the highest potential return on investment for the nation by increasing the quantity and quality MSI STEM graduates. This study also provides critical information and perspective about the importance of MSIs to other stakeholders in the nation’s system of higher education and the organizations that support them. Each year, the Gulf Research Program (GRP) produces an annual report to summarize how funds were used. These reports review accomplishments, highlight activities, and, over time, will assess metrics to determine how the program is progressing in accomplishing its goals. The 2016 annual report is the third report in this series. This report captures key developments and successes in 2016, as the GRP ramped up its grant offerings with five competitions for five different grant types: exploratory, synthesis, capacity building, research-practice, and research and development. The GRP continues to build on its past work and seeks to learn, think about, and plan for how and where it can have the greatest cumulative and lasting impacts. This Transportation Research Board's (TRB's) National Cooperative Highway Research Program (NCHRP) Research Report provides a practical decision-making framework that will enable state departments of transportation to identify and implement offsite cost-effective and environmentally beneficial water quality solutions for stormwater impacts when onsite treatment and/or mitigation is not possible within the right-of-way. The United States has long recognized that the nation’s prosperity and security depend on how we address challenges of disasters, poverty, famine, and disease around the world. The U.S. Agency for International Development (USAID) has played a vital role in promoting U.S. national and international interests by advancing strategies for employing science, technology, and innovation to respond to global challenges. This report provides an assessment and advice on the current and future role for science, technology, and innovation in assistance programs at USAID and on the role of partnerships in the public and private sectors to expand impact. Marine mammals face many natural and human stressors that can harm populations. Progress has been made in understanding the response of marine mammals to noise, but estimating risks to marine mammal populations requires understanding how the full array of stressors interact. This report offers a conceptual framework and research strategies to improve the ability to assess cumulative stressors to marine mammal populations and identify which combination of stressors to reduce to bring the population or ecosystem into a more favorable state. Each year, the National Academies Gulf Research Program produces an annual report to summarize how funds were used. The 2015 annual report is the second report in this series. This report captures key developments and successes in 2015, as the Gulf Research Program began to implement its strategic vision and conducted its first funding competitions, investing more than $6.5 million in institutions and people in the Gulf region and beyond. It also introduces four initiatives that characterize the program's main areas of interest. These initiatives will guide the development of a portfolio of grants, fellowships, and other activities with cumulative and lasting impact. The U.S. Global Change Research Program (USGCRP) asked the Academies to conduct a workshop to explore ways to frame the NCA4 and subsequent NCA reports in terms of risks to society. The workshop was intended to collect experienced views on how to characterize and communicate information about climate-related hazards, risks, and opportunities that will support decision makers in their efforts to reduce greenhouse gas emissions, reduce vulnerability to likely changes in climate, and increase resilience to those changes. This document summarizes the presentations and discussions from the workshop. As the nation’s economic activities, security concerns, and stewardship of natural resources become increasingly complex and globally interrelated, they become ever more sensitive to adverse impacts from weather, climate, and other natural phenomena. 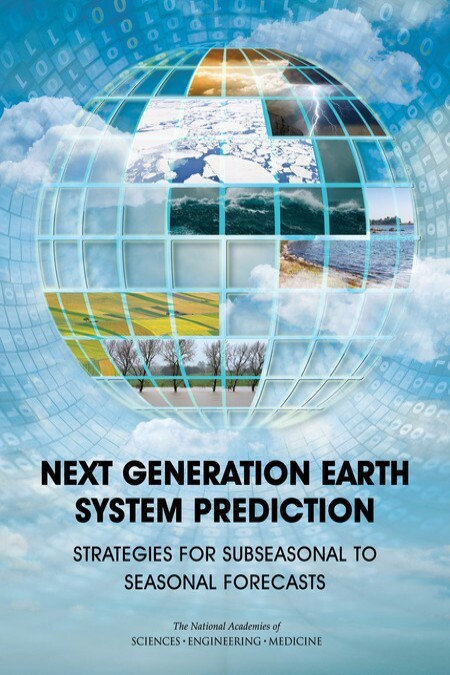 Developing the capability to forecast environmental conditions and disruptive events several weeks and months in advance could dramatically increase the value and benefit of environmental predictions, saving lives, protecting property, increasing economic vitality, protecting the environment, and informing policy choices.Over the past decade, the ability to forecast weather and climate conditions on subseasonal to seasonal (S2S) timescales, i.e., two to fifty-two weeks in advance, has improved substantially. This report presents a ten-year U.S. research agenda that increases the nation’s S2S research and modeling capability, advances S2S forecasting, and aids in decision making at medium and extended lead times. The Update to the Strategic Plan (USP) is a supplement to the Ten-Year Strategic Plan of the U.S. Global Change Research Program (USGCRP). The Strategic Plan sets out a research program guiding thirteen federal agencies in accord with the Global Change Research Act of 1990. 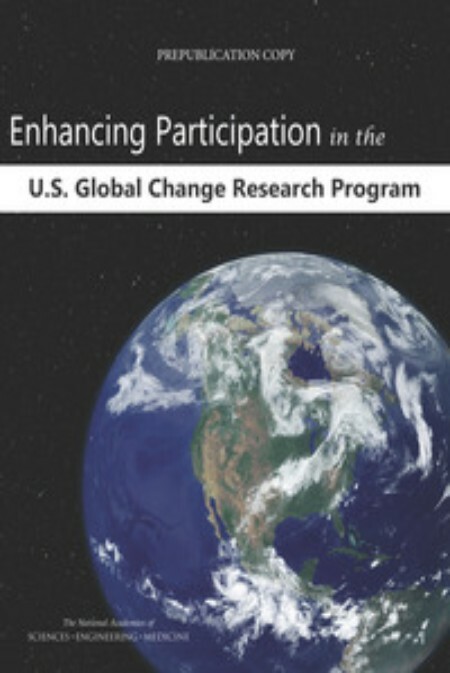 This report reviews whether USGCRP’s efforts to achieve its goals and objectives, as documented in the USP, are adequate and responsive to the Nation’s needs, whether the priorities for continued or increased emphasis are appropriate, and if the written document communicates effectively, all within a context of the history and trajectory of the Program. The social cost of carbon (SCC) for a given year is an estimate, in dollars, of the present discounted value of the damage caused by a 1-metric ton increase in CO2 emissions into the atmosphere in that year; or equivalently, the benefits of reducing CO2 emissions by the same amount in that given year. There are significant challenges to estimating a dollar value that reflects all the physical, human, ecological, and economic impacts of climate change. Recognizing that the models and scientific data underlying the SCC estimates evolve and improve over time, the federal government made a commitment to provide regular updates to the estimates. This interim report focuses on near-term updates to the SCC estimates. 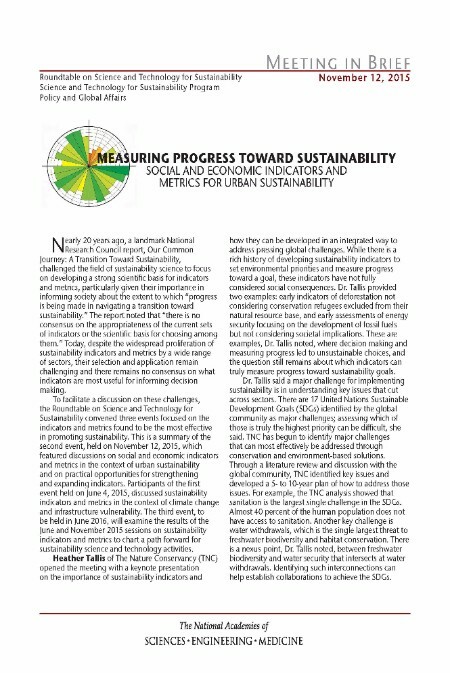 As the second event of the Roundtable on Science and Technology for Sustainability's 2015-2016 initiative, the November 2015 meeting featured discussions on social and economic indicators and metrics in the context of urban sustainability. This Meeting in Brief synthesizes the discussions held during the event. 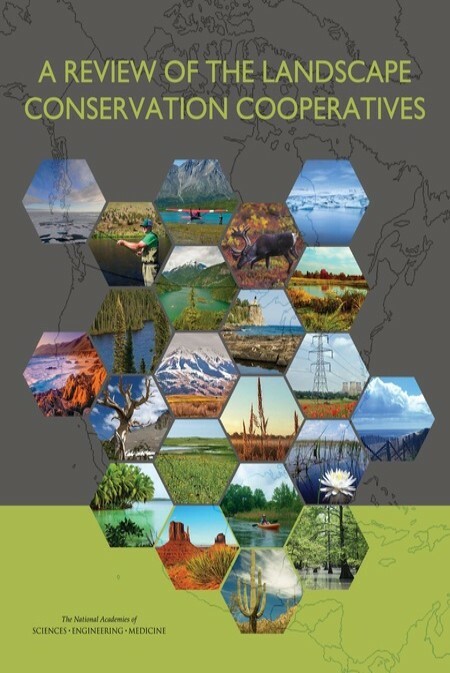 This report reviews the Landscape Conservation Cooperatives Network, which was initiated by the Department of the Interior and aims to address the widely recognized national need for a landscape approach to conservation. The Network includes 22 regional cooperatives tasked to build partnerships that facilitate collaborations across jurisdictional boundaries, develop shared priorities and common science needs, and create conservation strategies that Landscape Conservation Cooperative partners jointly implement. The report finds that individual Landscape Conservation Cooperatives can point to many early accomplishments, but the Network’s long-term success depends on developing better ways to demonstrate measurable benefits to its partners and the nation. The electromagnetic spectrum is a vital part of our environment. Measures of radio frequency emissions from natural phenomena enable both practical applications, such as weather predictions and studies of the changing of Earth's climate here at home, and reveal the physical properties of cosmic sources. 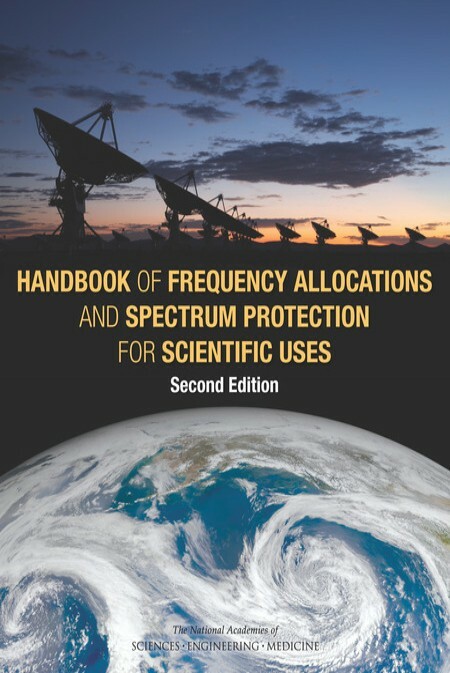 The spectrum is therefore a resource to be used wisely now and to be protected for future generations.This report describes the radio frequency bands used by scientific services and includes relevant regulatory information and discussion of scientific use of frequency bands, guiding spectrum managers and spectrum regulatory bodies on science issues and serve as a resource to scientists and other spectrum users. The US Global Change Research Program (USGCRP) is a collection of 13 Federal entities charged by law to assist the United States and the world to understand, assess, predict, and respond to human-induced and natural processes of global change. 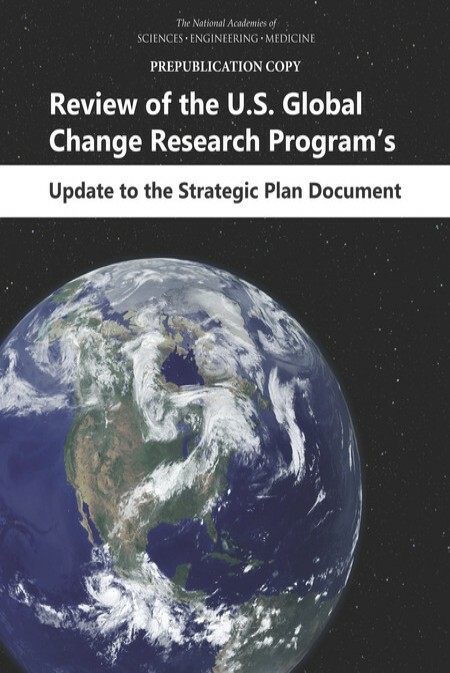 The USGCRP has increasingly focused on research that can inform decisions to cope with current climate variability and change, to reduce the magnitude of future changes, and to prepare for changes projected over coming decades.This report provides a rationale for evaluating current program membership and capabilities and identifying potential new agencies and departments in the hopes that these changes will enable the program to more effectively inform the public and prepare for the future. As a first event of the Roundtable on Science and Technology for Sustainability's 2015-2016 initiative, the June 2015 meeting hosted a session that provided an overview of the state of the science on sustainability indicators and metrics in the context of climate change and infrastructure vulnerability. The purpose of the session was to assess what indicators and metrics have been found to be the most useful for promoting sustainability as well as identify knowledge gaps related to developing indicators that integrate across the ecological, social, and economic sciences. This Meeting in Brief synthesizes the discussions held during the event. 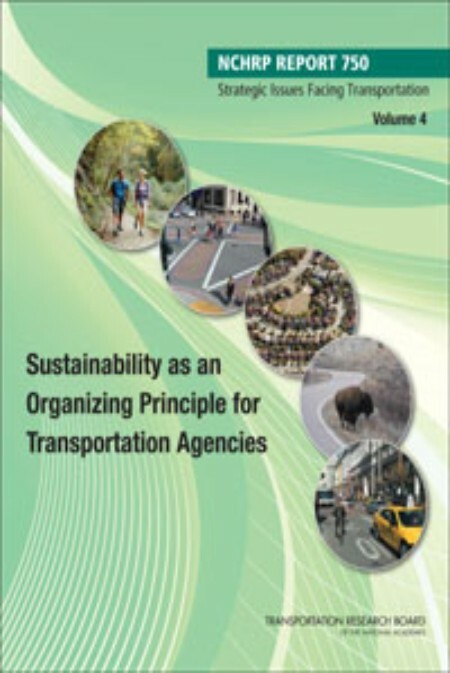 Transportation Research Board's (TRB's) National Cooperative Highway Research Program Report 750: Strategic Issues Facing Transportation, Volume 4: Sustainability as an Organizing Principle for Transportation Agencies includes an analytical framework and implementation approaches designed to assist state departments of transportation and other transportation agencies evaluate their current and future capacity to support a sustainable society by delivering transportation solutions in a rapidly changing social, economic, and environmental context in the next 30 to 50 years. Active remote sensing is the principal tool used to study and to predict short- and long-term changes in the environment of Earth--the atmosphere, the oceans and the land surfaces--as well as the near space environment of Earth. All of these measurements are essential to understanding terrestrial weather, climate change, space weather hazards, and threats from asteroids. 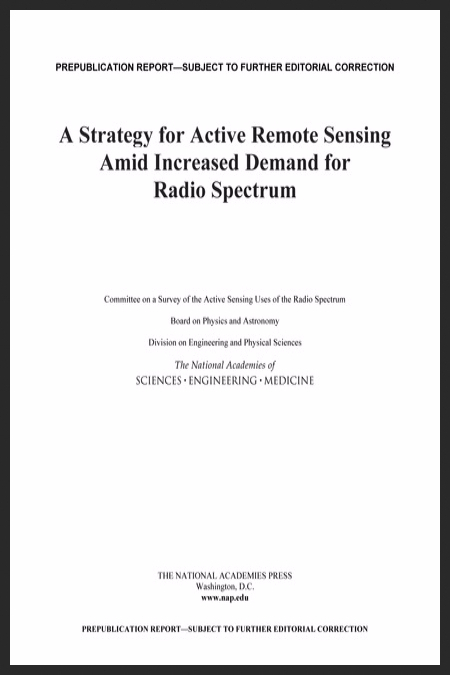 This report describes the threats, both current and future, to the effective use of the electromagnetic spectrum required for active remote sensing and offers specific recommendations for protecting and making effective use of the spectrum required for active remote sensing. Floods take a heavy toll on society, costing lives, damaging buildings and property, disrupting livelihoods, and sometimes necessitating federal disaster relief, which has risen to record levels in recent years. This report studies the pricing of negatively elevated structures in the National Flood Insurance Program (NFIP) reviews current NFIP methods for calculating risk-based premiums for these structures, including risk analysis, flood maps, and engineering data. The report then evaluates alternative approaches for calculating risk-based premiums and discusses engineering hydrologic and property assessment data needs to implement full risk-based premiums. Biowatch is an air monitoring system deployed in jurisdictions around the country with the goal of detecting the presence of certain high risk pathogenic microorganisms as part of intelligence-gathering and biomonitoring activities that support public safety and health. This report examines standards for PCR assays appropriate for the BioWatch program, providing recommendations on general principles for a performance standard and validation framework to meet BioWatch's mission. The 2012 National Research Council report Disaster Resilience: A National Imperative highlighted the challenges of increasing national resilience in the United States. One of the recommendations from the 2012 report stated that government entities at federal, state, and local levels and professional organizations should partner to help develop a framework for communities to adapt to their circumstances and begin to track their progress toward increasing resilience. 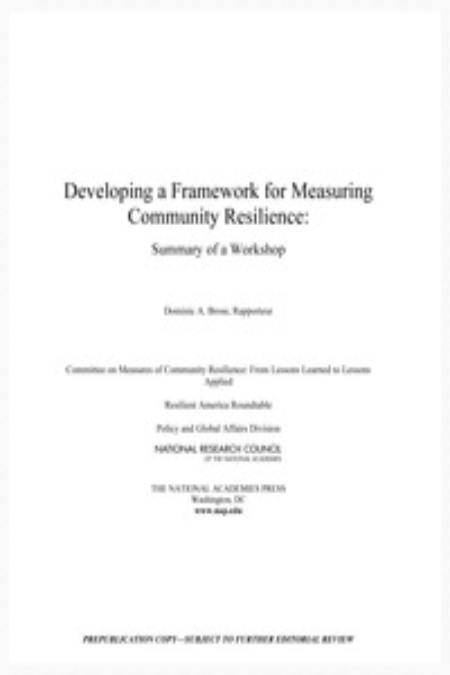 To build upon this recommendation and begin to help communities formulate such a framework, the Resilient America Roundtable of the National Academies convened a workshop on September 5, 2014. This report is a summary of the discussions held at the one-day workshop. 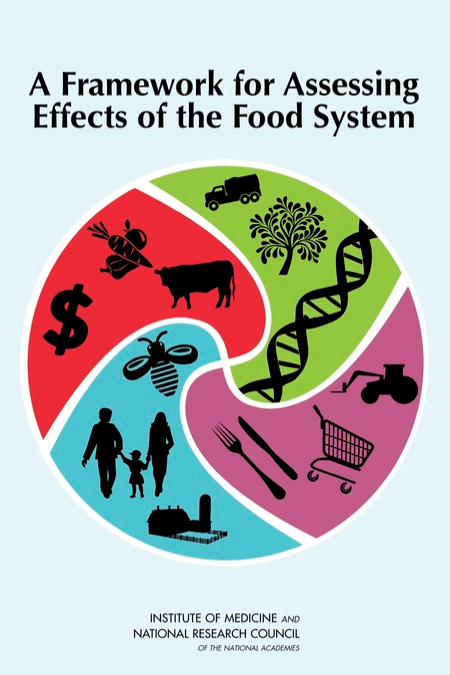 The U.S. food supply chain is deeply interconnected with human and environmental health, as well as social and economic systems. To arrive at a decision whose benefits outweigh its risks, decision makers must carefully consider a broad range of effects and interactions across the health, environmental, social, and economic domains. To aid in this complex analytical process, the Institute of Medicine and the National Research Council convened an expert committee to develop a framework to assist in food and agriculture decision making. This report presents guiding principles and practical steps to help stakeholders weigh tradeoffs and choose policies that integrate benefits and risks across various domains. Concerns about the health and environmental impacts associated with some chemical products and processes have motivated a growing number of national, state, and local governments, manufacturers, and retailers to develop assessments and approaches for finding safer chemical substitutes. These existing assessment frameworks reflect a range of different priorities, whether the focus is on protecting workers, the environment, the end users of products, or other interests. 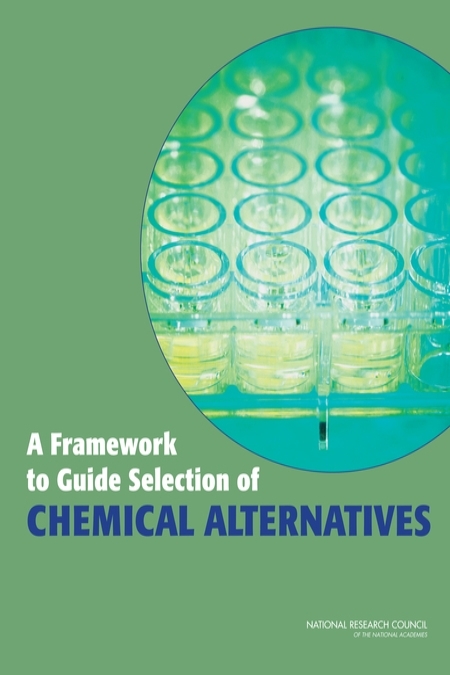 This report builds on those frameworks to develop a more universally-applicable decision framework for evaluating potentially safer chemical alternatives. EPA applies scientific results that have been provided by various parts of its own organization and by external organizations. The agency requires substantial high-quality inhouse scientific expertise and laboratory capabilities so that it can answer questions related to regulation, enforcement, and environmental effects of specific chemicals, activities, and processes. 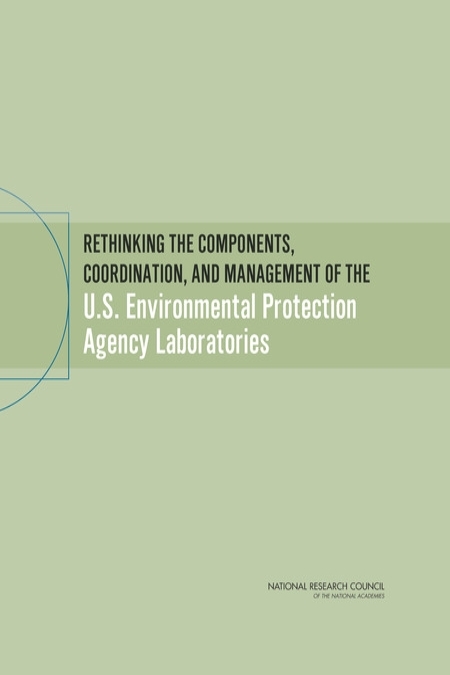 This report assesses EPA's highest-priority needs for mission-relevant laboratory science and technical support, develops principles for the efficient and effective management of EPA's laboratory enterprise to meet the agency's mission needs and strategic goals, and develops guidance for enhancing efficiency and effectiveness now and during the next 10 years. The findings and recommendations of this report will help EPA to develop an implementation plan for the laboratory enterprise. 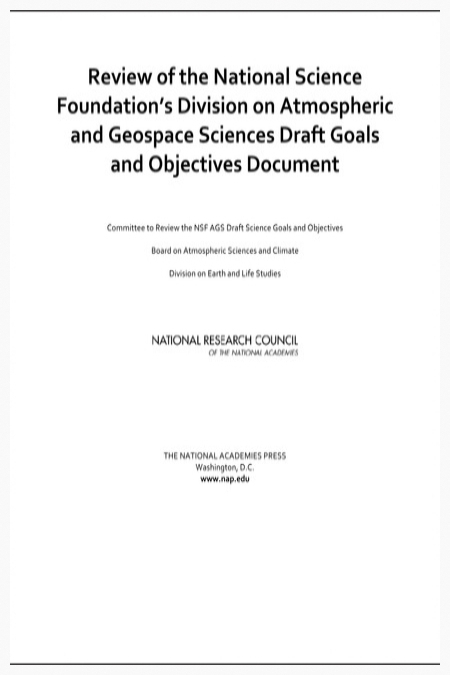 This report is a letter report by an ad hoc committee reviewing the National Science Foundation's (NSF's) Division on Atmospheric and Geospace Sciences (AGS) draft goals and objectives. It addresses the following questions: Are the goals and objectives clear and appropriate? Are there any content areas missing from the draft that should be present if AGS is to achieve its overall vision and mission? Are there adequate mechanisms for coordinating and integrating issues that involve multiple disciplines and multiple divisions within NSF and other agencies within the atmospheric and geospace sciences enterprise? Climate change poses challenges as well as opportunities for businesses and, broadly speaking for the entire economy. Businesses will be challenged to provide services or products with less harmful influence on the climate; respond to a changing policy, regulatory, and market environment; and provide new services and products to help address the challenges of a changing climate. 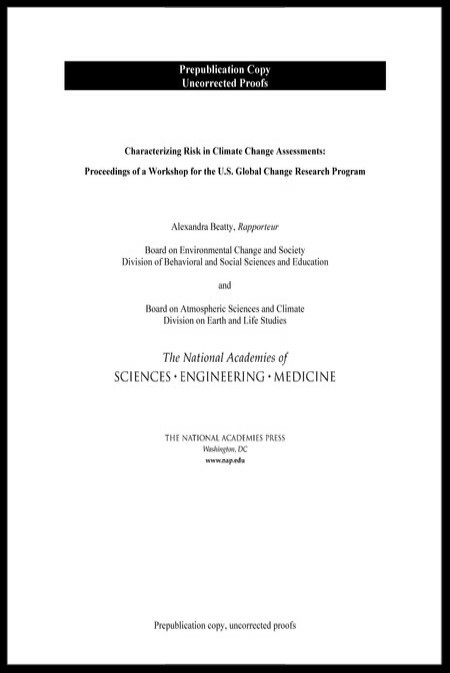 This report summarizes a workshop hosted in March 2013 to explore issues associated with teaching climate change-related topics in business schools. The workshop focused on major gaps in understanding of climate and sustainability education in postsecondary professional schools of business. Amid rapid environmental change, a strong understanding of the natural world is more important than ever. Field stations and marine laboratories place scientists on the front lines of our changing Earth, helping them gather the data needed to better understand shifting climate and ecosystems and make robust projections of future conditions. Field stations are a critical component of our scientific infrastructure that bring the basic tools of science into the field and connect scientists, educators, and communities to the environment. But to fulfill their vital role, field stations must evolve. This report explores strategies to harness the power and potential of field stations to address complex challenges in science and society. Convergence of the life sciences with fields including physical, chemical, mathematical, computational, engineering, and social sciences is a key strategy to tackle complex challenges and achieve new and innovative solutions. However, institutions face a lack of guidance on how to establish effective programs, what challenges they are likely to encounter, and what strategies other organizations have used to address the issues that arise. This advice is needed to harness the excitement generated by the concept of convergence and channel it into the policies, structures, and networks that will enable it to realize its goals. This report investigates examples of organizations that have established mechanisms to support convergent research. This report is the summary of a three-part public webinar convened by the Institute of Medicine's Roundtable on Environmental Health Sciences, Research, and Medicine and its collaborative on Global Environmental Health and Sustainable Development. Presenters and participants discussed the role of health in measuring a country's wealth (going beyond gross domestic product), health scenario communication, and international health goals and indicators. This report examines frameworks for global development goals and connections to health indicators, the role for health in the context of novel sustainable economic frameworks that go beyond gross domestic product, and scenarios to project climate change impacts. Urban development, agriculture, and energy production are just a few of the ways that human activities are continually changing and reshaping the Earth's surface. Land-change models (LCMs) are important tools for understanding and managing present and future landscape conditions, from an individual parcel of land in a city to the vast expanses of forests around the world. A recent explosion in the number and types of land observations, model approaches, and computational infrastructure has ushered in a new generation of land change models capable of informing decision making at a greater level of detail. This National Research Council report evaluates the various land-change modeling approaches and their applications, and how they might be improved to better assist science, policy, and decision makers. As the Gulf of Mexico recovers from the Deepwater Horizon oil spill, natural resource managers face the challenge of understanding the impacts of the spill and setting priorities for restoration work. The full value of losses resulting from the spill cannot be captured, however, without consideration of changes in ecosystem services--the benefits delivered to society through natural processes. This report discusses the benefits and challenges associated with using an ecosystem services approach to damage assessment, describing potential impacts of response technologies, exploring the role of resilience, and offering suggestions for areas of future research. Science is increasingly driven by data, and spatial data underpin the science directions laid out in the 2007 U.S. Geological Survey (USGS) Science Strategy. A robust framework of spatial data, metadata, tools, and a user community that is interactively connected to use spatial data in an efficient and flexible way—known as a spatial data infrastructure (SDI)—must be available for scientists and managers to find, use, and share spatial data both within and beyond the USGS. Over the last decade, the USGS has conducted breakthrough research that has overcome some of the challenges associated with implementing a large SDI. This report is intended to ground those efforts by providing a practical roadmap to full implementation of an SDI to enable the USGS to conduct strategic science. As climate change has pushed climate patterns outside of historic norms, the need for detailed projections is growing across all sectors, including agriculture, insurance, and emergency preparedness planning. This reportemphasizes the needs for climate models to evolve substantially in order to deliver climate projections at the scale and level of detail desired by decision makers, this report finds. Despite much recent progress in developing reliable climate models, there are still efficiencies to be gained across the large and diverse U.S. climate modeling community. Evolving to a more unified climate modeling enterprise-in particular by developing a common software infrastructure shared by all climate researchers and holding an annual climate modeling forum-could help speed progress. Science at the U.S. Geological Survey is intrinsically global, and from early in its history, the USGS has successfully carried out international projects that serve U.S. national interests and benefit the USGS domestic mission. Opportunities abound for the USGS to strategically pursue international science in the next 5-10 years that bears on growing worldwide problems having direct impact on the United States-climate and ecosystem changes, natural disasters, the spread of invasive species, and diminishing natural resources, to name a few. Taking a more coherent, proactive agency approach to international science-and building support for international projects currently in progress-would help the USGS participate in international science activities more effectively. During the 1980s and 1990s, the National Weather Service undertook a major, comprehensive modernization effort that succeeded in achieving major improvements for the weather, water, and climate enterprise. Despite this success, accelerating improvements in technology and the science of meteorology and hydrology imply that continuing modernization of the National Weather Service (NWS) is required. This report uses lessons learned from the 1990's modernization process to develop guidance on how best to plan, deploy, and oversee future improvements to the National Weather Service. A broad and growing literature describes the deep and multidisciplinary nature of the sustainability challenge. 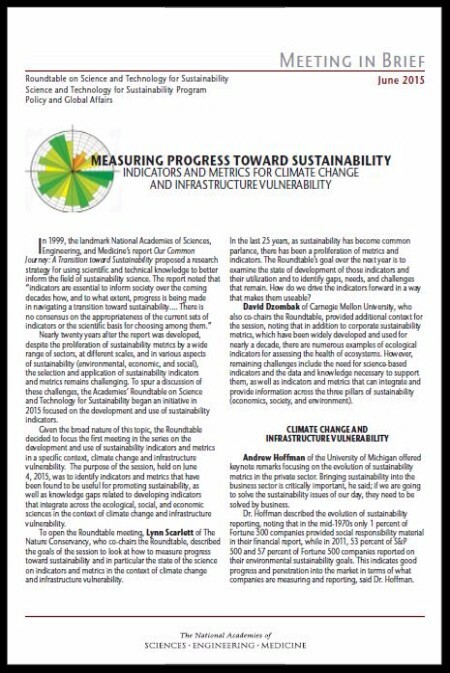 A just-completed study by the National Academies' Computer Science and Telecommunications Board, chaired by Deborah Estrin (UCLA) and sponsored by the National Science Foundation (NSF), concludes that there is a clear and critical role for the application of information technology (IT) and for computing research in advancing the nation's and world's sustainability goals. IT provides an essential bridge between technical and social solutions because it fosters economic, political, and cultural adjustments by enhancing communication and transparency. Moreover, IT is at the heart of nearly every large-scale socioeconomic system-financial manufacturing, energy, and so on. Innovation in IT must thus play a vital role if the nation and the world are to achieve a more sustainable future. The report highlights opportunities for IT innovation and computer science (CS) research and urges the computing research community to bring its approaches and methodologies to bear in ways that will have significant, measurable impact on sustainability. The Modernization and Associated Restructuring (MAR) of the National Weather Service (NWS) was a large and complex re-engineering of a federal agency. The process lasted a decade and cost an estimated $4.5 billion. The result was greater integration of science into weather service activities and improved outreach and coordination with users of weather information. The MAR created a new, modernized NWS, and, significantly, it created a framework that will allow the NWS to keep up with technological changes in a more evolutionary manner. This report presents the first comprehensive assessment of the execution of the MAR and its impact on the provision of weather services in the United States. This report provides an assessment that addresses the past modernization as well as lessons learned to support future improvements to NWS capabilities. Factoring health and related costs into decision making is essential to confronting the nation's health problems and enhancing public well-being. Some policies and programs historically not recognized as relating to health are belived or known to have important health consequences. For example, public health has been linked to an array of policies that determine the quality and location of housing, availability of public transportation, land use and street connectivity, agricultural practices and the availability of various types of food, and development and location of businesses and industry. This report offers guidance to officials in the public and private sectors on conducting HIA's to evaluate public health consequences of proposed decisions -- such as those to build a major roadway, plan a city's growth, or develop national agricultural policies -- and suggest actions that could minimize adverse health impacts and optimize beneficial ones. The global scientific and policy community now unequivocally accepts that human activities cause global climate change. Although information on climate change is readily available, the nation still seems unprepared or unwilling to respond effectively to climate change, due partly to a general lack of public understanding of climate change issues and opportunities for effective responses. 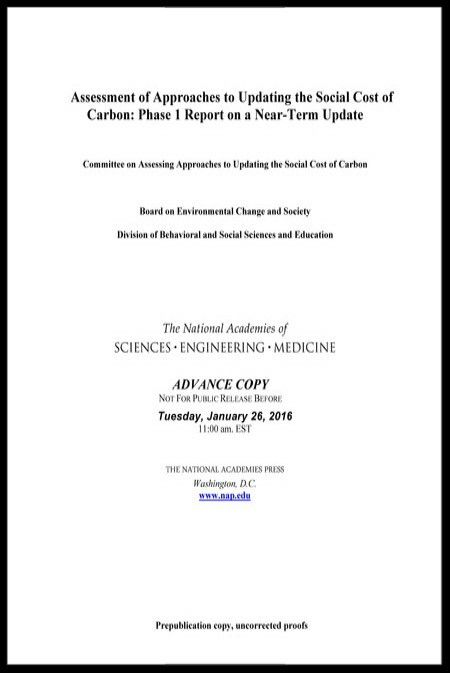 Congress, in its 2009 and 2010 appropriation process, requested that the National Science Foundation create a program in climate change education to provide funding to external grantees to improve climate change education in the United States. To support and strengthen these education initiatives, the Board on Science Education of the National Research Council created the Climate Change Education Roundtable. This report is a summary of the discussions and presentations from the first workshop, held October 21 and 22, 2010.